We're on the Garden tour in June 2010! We have been given the honor of being chosen for the June 19th, 2010 BAFFA (Bay Area Friends of the Fine Arts) and Sayville Garden Club Tour," A Little Garden Music". The two organizations have joined together to present a tour of seven local homes in order to combine the arts with an appreciation for horticulture. The Sayville Garden Club was established in 1927 and members work together to beautify the community, raise environmental awareness and develop an appreciation for horticulture. BAFFA was formed in 1968 by a small group of local residents and has grown to be well known for its appreciation for the arts and contributions to the community through art and music. We are so happy to have been selected for this tour and are looking forward to sharing our property and knowledge of horticulture with others. This is where our story begins. Built in 1953, our home stands on what was once a gladiola farm. Our gardens originated from a vast lawn shadowed by maple and wild cherry trees along with an original iris garden that still exists today. My husband and I have resided here since 1982 and it all started when we decided to install an in ground pool in 1996. At that time I had been studying landscape design and now had the perfect palette to work with-our own backyard! That is where it all blossomed (no pun intended). As time went on I had an increasing desire to expand on the design of the property. As time allowed, our once vacant lot has transformed over the years into a private sanctuary for us to enjoy, and the gardens have become a part of what brings joy into our lives. 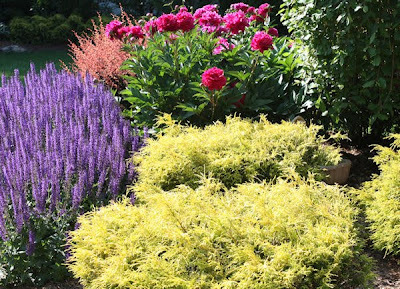 Our grounds consist of colorful evergreens, flowering shrubs, grasses and perennials that highlight every season of the year. The centerpiece of the back garden is a mountain lake pool and patio surrounded by a waterfall and gardens. There are Star Magnolia, Weeping Norway Spruce, Weeping Blue Atlas Cedar, Weeping White Pine, Crepe Myrtle, Spirea, Daylily, Salvia, Coral Bells and Astilbe among other plantings. Golden Oriental Spruce, Blue Atlas Cedar, Hinoki Cypress, Barberry, Gold Lace Juniper, Nepeta and Coreopsis highlight the front gardens and accent pieces of moss rock boulders are used throughout the property. When not designing I can be found in my gardens planning the next addition, a never-ending process. "A garden is an extension of its owner; a thing of beauty that constantly changes and can be enjoyed forever.